We have quite a few John Cleese fans here at Book Riot, including Jenn Northington and myself. When we were offered the chance to speak to the Monty Python veteran about his audiobook memoir So Anyway…, we did a few silly walks of our own, and then got down to business, asking the comedy genius about his thoughts on audiobooks, writing, comedy, psychology, and more. 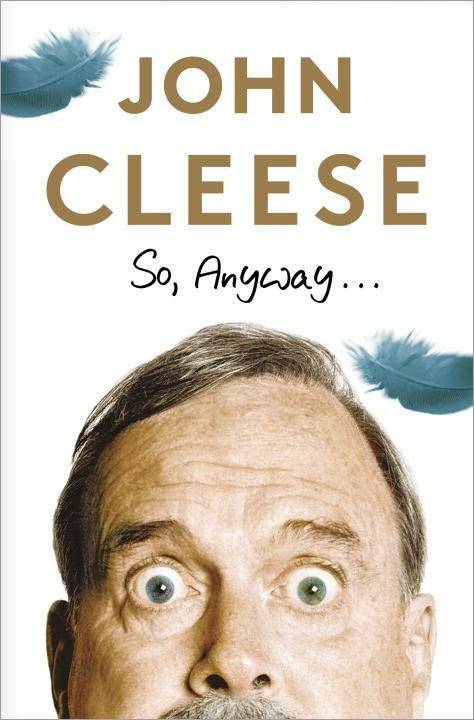 Swapna Krishna: Mr. Cleese, thank you so much for taking the time to speak with Book Riot today. I’m a huge fan of Fawlty Towers and Monty Python, so this is a huge honor for me. John Cleese: Thank you! I really appreciate it. SK: My first question relates to the publication of your memoir. It was published in print in 2014, but the audiobook is just coming out. Why was there a delay? JC: I think it was just that, when I finished the book, I finished of course on the last day, the deadline, I remember it was on August 31. I’d been working on the book for 2 years and when you are on a long project, and you finally finish it, you think, “Great!” You want to get away from it for a bit. You’ve been with it too long. I wanted to do the audiobook myself, and I spent an awfully large number of hours doing it. We really did, it was extraordinary. I think there were something like 20,000 edits. And I didn’t want to start doing it like that. I wanted to do it properly, I didn’t want to do it until I felt like doing it. If you start forcing yourself to do things, you are going to get tired of them and that lack of interest, even if you’re trying very very hard, will just mean there’s a little bit less life to what you’re doing. We redid a lot of stuff. So there was no great pressure to do it, and Random House were happy to wait until I wanted to do it. And when I finally got down to doing it, I was very keen to do it. And I have to tell you, I’m absolutely delighted with it, because Andre did such an extraordinary job editing together all the very best bits. I think it’s the best thing that I’ve ever done. SK: I personally loved it. I read the print memoir when it came out, and relistened to the audiobook recently. There were definitely a few times I laughed out loud when reading the print book, but I couldn’t listen to the audio in public because I was constantly laughing. JC: Thank you, I’m pleased! That was the objective. SK: Was it strange to read your own words after that break? JC: No, but every now and again, I would find something or a phrasing I didn’t like and think, “That’s a little bit clumsy, I don’t remember that.” More than once or twice, to be perfectly honest, I realized that my editor, whom I adore, had edited stuff, moved stuff around a little bit. There were certain, what I would call “infelicities” or clumsinesses, and I simply corrected them. I thought there was no point in reading text I think could be improved. So I would rewrite it a little bit, make it a little bit better, but I mean nobody cares. They just want to hear something good. I think it’s true of all comedy, that it’s always a work in progress. Whenever you’re at the end of a show, you always know you could have done some things better, and you try again the next night. SK: I am very curious about how the book ends. It ends just as Monty Python is beginning—do you have plans for a second memoir? Is there a reason you decided to stop at that point? That was a good plan and it was fine for a year, but then the Pythons got together and decided to do the O2 show, and I thought to myself, “Well, I can’t ignore the O2 show.” So basically, I wrote a chapter at the end in which I sort of compared Python at the very beginning to Python when we did our very last show. So I needed to make a nod in the direction of the O2 show, but I didn’t want to get drawn into doing too much about Python because at that point, there wasn’t enough time anyway. I thought the book was going to be long enough, and I could stop. SK: So is there a second memoir in the works? Or are you open to the idea of doing another memoir? JC: Oh yes, yes! I’ve always intended to. JC: (Laughs) I do believe in doing things when you feel enthusiastic about them, and after this book, I said to myself, “I don’t really want to start on the next book until I feel full of energy and thinking, ‘Yes I want to do this now!’” And I didn’t feel that when I’d finished the first book, because I’d been doing that for two years. And now I’m feeling very much ready to go and am rather looking forward to it, so that’s the right state of mind. On the occasions that I’ve rushed into doing things before I felt that they were quite right, they’ve usually never worked. SK: With Python and Fawlty Towers, most of your work has fans across generations. Are you surprised by the longevity of the material and how well it’s aged? JC: Yes, I am very surprised. I don’t entirely understand it. It’s one of two things. First, logically, we were lucky enough to set both of our films during a historical period, which means they don’t date. Which is great—we didn’t think about it at the time. But why the TV series, which was made in ’69–’71, why that continues to play so successfully is a bit of a puzzle. I always want to say, “Well, ask the audiences because they know as well as I do.” I think it was just a very different humor at that time. The strange thing is, most things when they’re successful spawn lots and lots of copies. But I’ve never really seen anything that made me think, “Oh yes, that’s been very influenced by Python.” A lot of American and English comics have said to me how much Python influenced them, and some people have even said that’s why they went into show business, they loved it so much and thought, “I want to do that.” But I very seldom see anything that looks as though it’s been influenced by Python. SK: You mentioned before that you co-wrote psychiatry books, and you just generally talk a lot about it in your memoir. How has your study of psychology and psychiatry affected how you approach and do and write comedy? JC: I think it affects my approach to everything because it’s basically about how the human mind works. Whenever you learn something else new about how the human mind works, you incorporate that into how your own mind works. Every time I’ve learnt something new, it affects beneficially what I’ve been doing. People are sometimes worried about going to therapy because they say it will rob them of their creativity. I don’t think that’s true. I’ll tell you what I think it does. I think it robs one of the compulsion to be creative all the time. I remember having a conversation with Terry Gilliam and Michael Palin about that one. Gilliam, of course, thinks it robs you of your creativity. And I said, “No, but I think it robs you of a bit of your drive, that manic side that couldn’t stop and always had to be working.” And that, I think gets much better, you then begin to work when you want to work. It’s not so manic, it’s not so driven anymore. So far as the content is concerned, I think it certainly broadens the area in which you can use your comic ability, because it means you explore yourself. There are less and less areas that you feel uncomfortable about. You can start going into those areas and making fun. SK: Because we’re a book publication, I have to ask: You played Nearly Headless Nick in Harry Potter. Are you a fan of the Harry Potter books? JC: No I’m not really, I enjoyed the experience, but I have very specific tastes. I like reading things that are informative. I read a lot of nonfiction, and I’m particularly fond of spy stories. I like Alan Furst, for example, who writes spy situations between 1936 and 1944, that sort of thing.